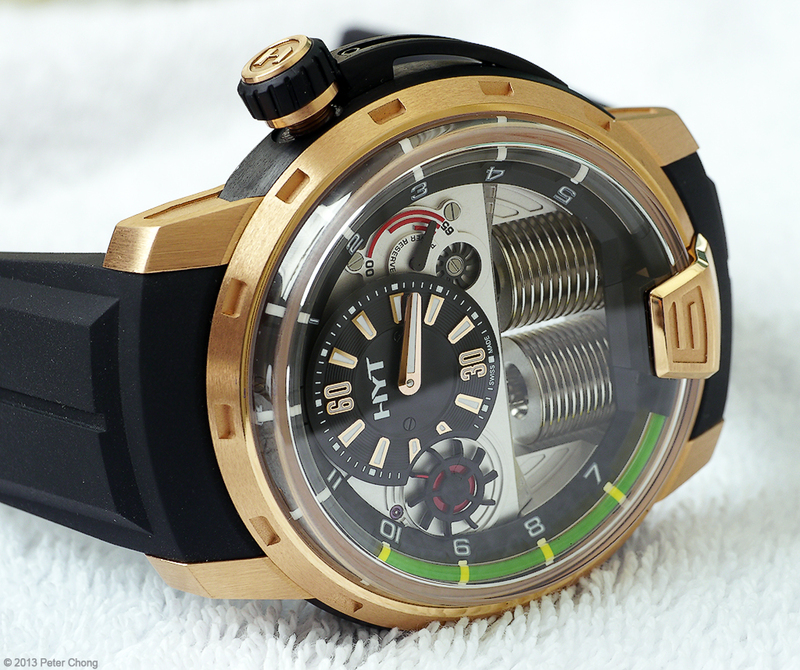 Watchscapes: High Resolution Photography by Peter Chong: HYT H1: Hydro Mechanical Watch...tres intersting. 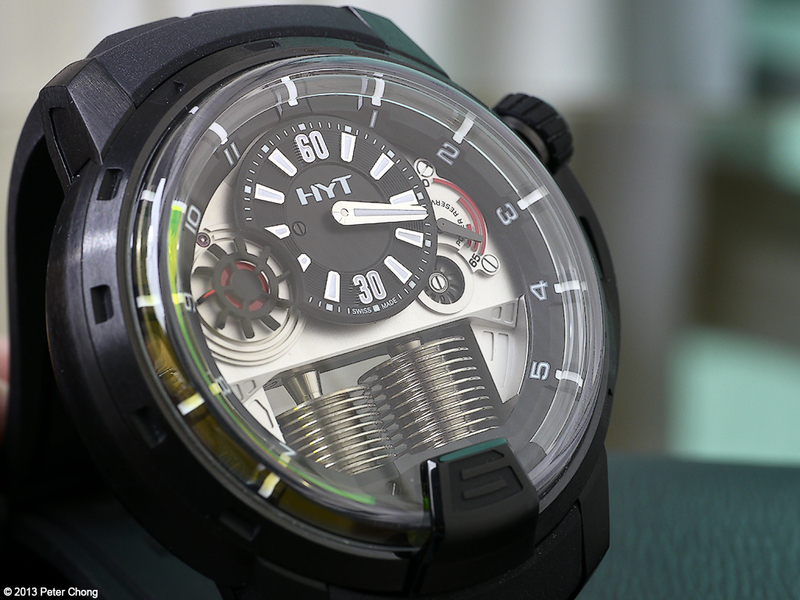 The HYT watch broke new ground when it was introduced in Basel in 2012. Interesting because the concept of showing time in a continuous fashion using water has existed since the begining of civilizations...both the Chinese and the ancient Egyptians. 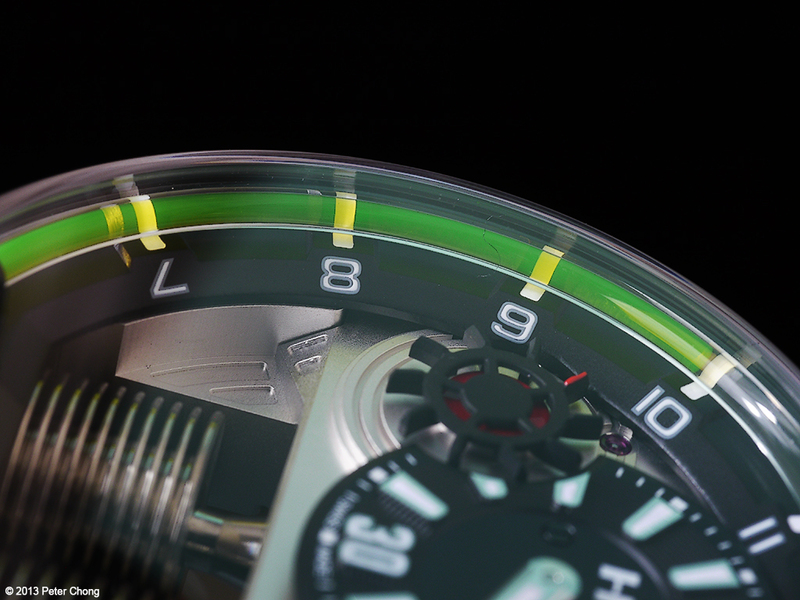 And yet, with the HYT, a most advanced methodology is used to allow liquids to indicate the passage of time again. 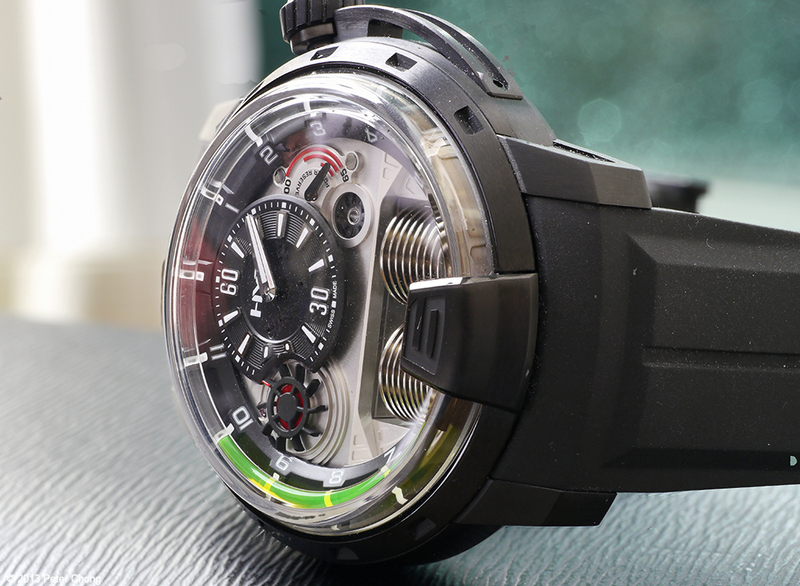 The watch is rather large...48mm diameter, though when I first looked at it, I didn't think it was that big...the design somehow made the watch look and feel a bit smaller. 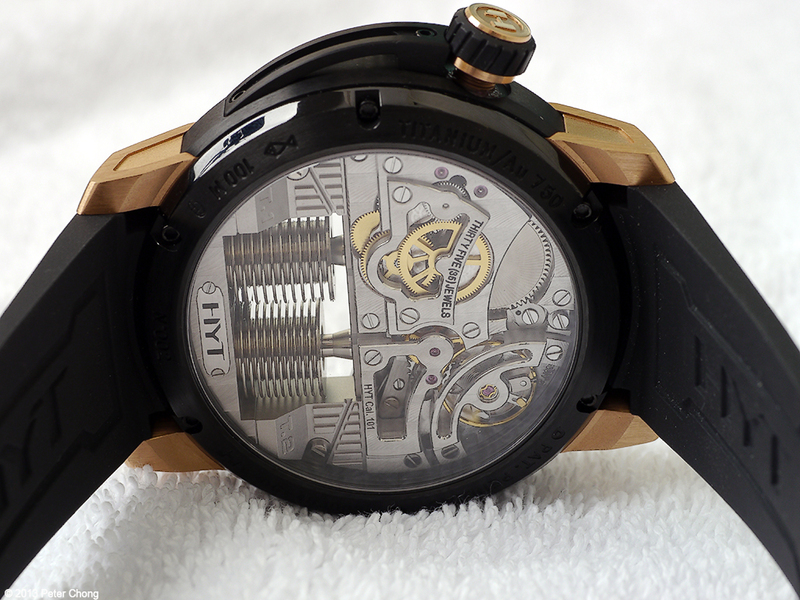 But it is a large timepiece. The design is rather interesting. The watch also divides itself into two clear areas...the top part of the movement is utterly traditional...with anglages, bridges, all beautifully and traditionally executed. 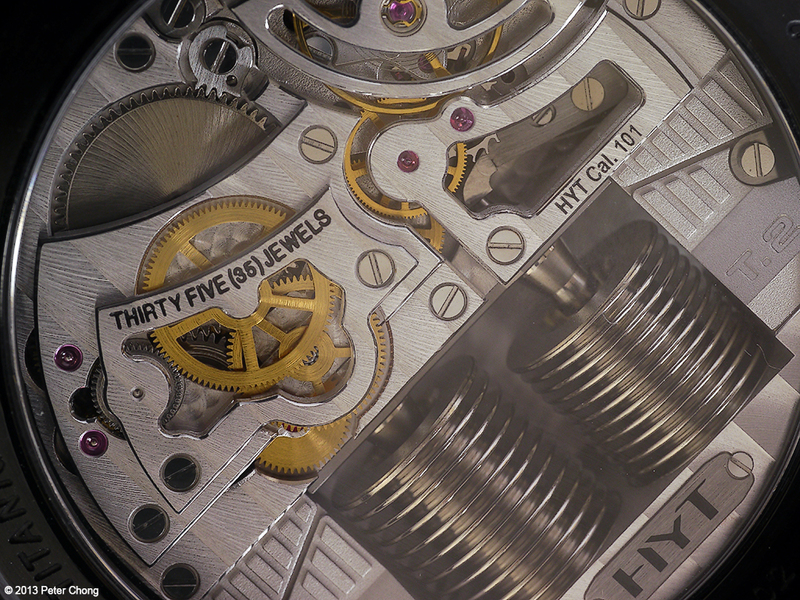 A standard Swiss Anchor escapement running at 28,800 bph holds the timekeeping. 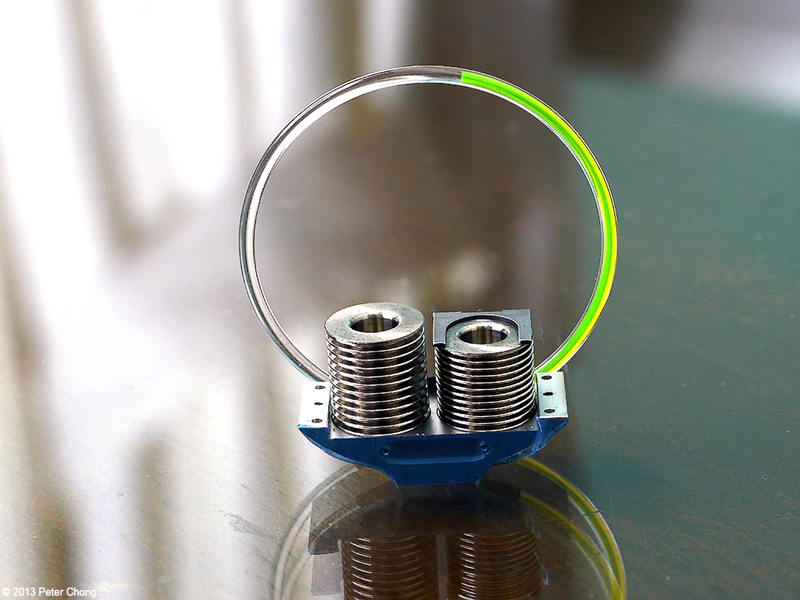 But at the lower part of the movement, is the bellows, which in a push pull fashion pumps the fluid around the glass loop to indicate passage of time. Two fluids are used...the greenish one is water based, and the other transparent one is oil based, ensuring they never mix. I pushed on one of the bellows to experience the force needed to move the indication...though it was not a lot, I felt it was rather strong to have required this amount of force from the second pinion of the train, as the fluid is used to indicate the hours passed. 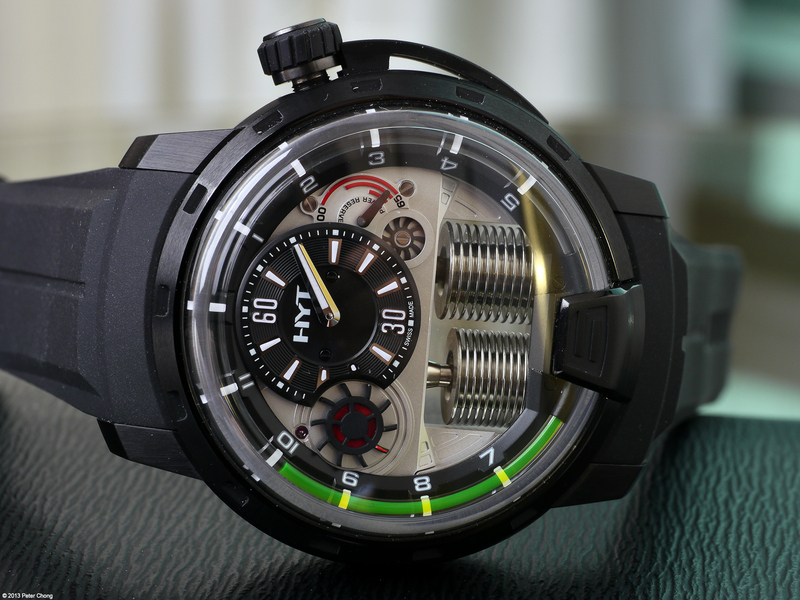 In this prototype watch, the indication is not precise....that is at say 4:30, the liquid might not be midpoint between 4 and 5 as it should. An additional 3 wheels will be put into place in the production units to fix this. Another early issue which cropped up is the expansion of the fluids with respect to temperature...this was also solved, but it was not explained to me how they did it.